Vancouver, British Columbia--(Newsfile Corp. - February 6, 2019) - Max Resource Corp. ("MAX" or the "Company") (TSXV: MXR) (OTC Pink: MXROF) (FSE: M1D1) is pleased to announce exploration results from the Company's 1,757 sq. km gold bearing conglomerate "Choco Precious Metals Project", located 100km SW of Medellin, Colombia. • Field exploration continues, with the objective of increasing the lateral extent of the conglomerates and gold mineralization of the Company's Choco Precious Metals district area. Brett Matich, Max's President and CEO commented: "The continuing exploration success suggests Max may well be on the cusp of a new gold discovery. The results of this exploration program will provide an indication of the scale of this project." 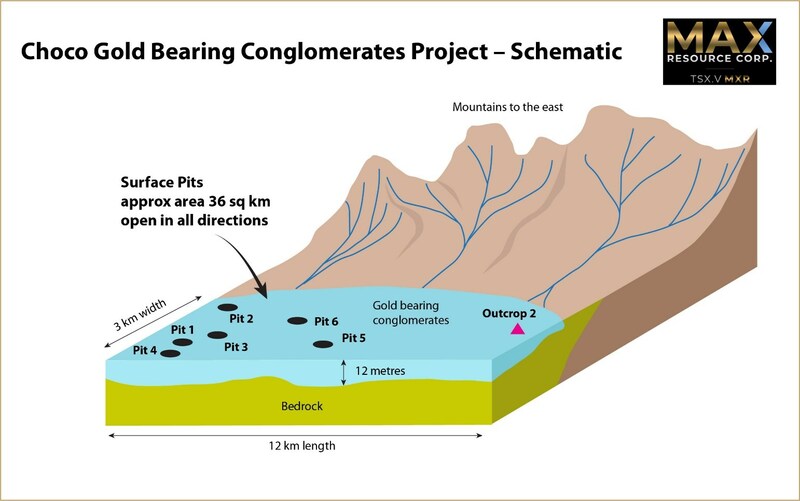 As shown in the above Exploration Strategy Schematic, the Company is working on an exploration model where the gold bearing conglomerates have formed at the base of the western slopes of the mountains to the east. The Company considers systematic bulk sampling at surface to be the most practical means of determining grade, processing characteristics and the lateral extent of the flat-lying gold bearing mineralized system. Sampling exposed faces of outcrops will provide initial assessment of thickness, depth and vertical continuity of the gold through the system. The six 2m by 2m by 30cm deep trial pits are excavated from surface by pneumatic hammer. A measured specific gravity of 2.2 indicates + 2,000 kg of hard rock conglomerate is collected from each pit. The on-going exploration in the central part of the mineralized area indicates a vertical thickness of 12metres. Samples were taken down the face of the outcrop to determine gold distribution vertically through the conglomerate. Analytical results are pending. MAX has 100% ownership of 82 and 50% of 7 mineral license applications, totaling over 1,757 sq. km located within Choco Department approximately 100km SW of the city of Medellin, Colombia. Compania Minera del Choco Pacifico ("Choco Pacific") produced 1.5 million ounces of surface gold and 1.0 million ounces of surface platinum from the "Choco District" between 1906 to 1990, largely limited to an average depth of 8 meters or less. MAX's Choco Precious Metals Project covers or is adjacent to much of Choco Pacific's historic exploration and production areas. Choco Pacific historic reports indicate the hard rock conglomerates underlying the surface production areas are gold-bearing, extensive, shallow and generally flat lying with thicknesses from a few metres to 20 metres. Sampling integrity is essential. The conglomerate (hard rock) surface is cleaned and a 2m by 2m square is marked. A pneumatic hammer then chips and breaks the conglomerate outcrop to a depth of 30cm. The broken conglomerate is collected in pre-numbered rice bags; approximately 25kg per bag. Each pre-numbered bag is sealed by the geologist and transported to secure, locked storage at the Novita Camp, in Choco. Two bags per pit are then transported by Company personnel to the town of Istmina, where the bags are transported to Medellin for processing at Actlabs Medellin and the CIMEX Mineral Institute at the Medellin Mines Faculty of the National University of Colombia. Each approximate 50kg sample is first crushed to 2 millimeters (2mm). The -2mm and +2mm fractions are separated by sieving with each fraction subsequently pulverized. The -2mm fractions are concentrated by gravity pan and visually examined for free gold by MAX technical personnel. There has been no analysis conducted on the +2mm fraction. 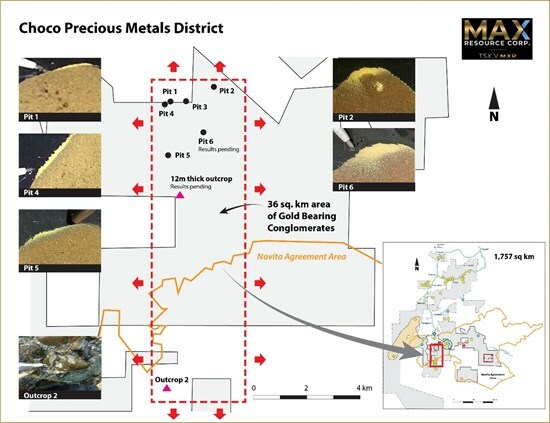 As previously announced (see Max press release January 28, 2019), Max continues to pursue the acquisition of mineral rights and concessions in and around the Novita Project from Condoto Platinum Ltd., a wholly-owned subsidiary of Noble Metals Limited. Because Max proposes to issue 26,665,896 common shares to Noble Metals on the closing of this transaction (constituting approximately 32.7% of the issued and outstanding shares of Max after adjusting for the transaction), the transaction would constitute Noble Metals as a new 'control person' of Max and requires both TSX Venture and shareholder approval. Max has been working with TSX Venture in an effort to obtain conditional approval while simultaneously adjusting the transaction structure to remediate concerns developed over the course of its due diligence. Max anticipates that it should be in a position to request shareholder approval in the near future. The transaction remains subject to TSX Venture approval.